What are cataract symptoms? How long is cataract surgery recovery? How much does cataract surgery cost? What does insurance pay for cataract surgery? Can you get cataracts again? Which IOL should I choose? If you have been researching the dizzying array of cataract information available today, you may be feeling overwhelmed! Hopefully, you will find answers to your questions below to ease your concerns about your upcoming cataract surgery. If you still have questions or concerns, please call our Cape Girardeau Doctor’s Park office, Poplar Bluff office, or Cape Girardeau office to speak to a technician. Can you get cataracts again? You may have heard the term “secondary cataract” or “after-cataract” and begin experiencing cataract symptoms similar to before surgery. Once your natural lens is replaced with an IOL, the new intraocular lens will not develop a cataract like your natural lens. Although it’s not technically a “cataract”, a secondary or after-cataract occurs when the capsule holding the IOL becomes cloudy. This is called posterior capsule opacification (PCO) and can develop months or even years after your cataract surgery. There is no reason for alarm. PCO is very common and can affect up to 50 percent of post-cataract patients9 and can be treated with a simple, painless, in-office procedure using a YAG laser to restore your vision. What are the risks and potential side effects of cataract surgery? How will my eyes feel after surgery? Cataract surgery with a standard, monofocal IOL is covered by insurance and Medicare and is applicable to your deductible. If you elect to upgrade to a premium IOL (toric, multifocal, extended depth of focus, and accommodating), the additional cost for the lens and surgical fee will be out of pocket. If I choose a premium IOL, how much extra does it cost? A lifestyle IOL uses advanced technology to help you be less dependent on glasses after surgery. Only standard IOLs are covered by Medicare and commercial insurance. A lifestyle IOL is considered an elective upgrade and will include out-of-pocket costs. If you qualify for a lifestyle IOL, the most up-to-date pricing is included on your elective upgrade consent form which will be reviewed with you by your surgeon’s technician at your pre-operative exam. Why do some people need glasses after cataract surgery and others do not? Not everyone is a candidate for a premium IOL. Not everyone who is a candidate for a premium IOL, elects to incur the extra out-of-pocket costs associated with the more advanced technology lens. Depending on your prescription and the IOL you choose, you can lessen your dependence on glasses. Your surgeon will help you determine which IOL options best fit your prescription, lifestyle, and budget. What is cause for concern after cataract surgery? Will cataracts correct issues with my night vision? Cataracts can cause a loss of contrast in dim lighting, glare, and difficulty seeing at night. Surgery should alleviate these issues if they are due to the cataract. However, nighttime glare and halos around lights are possible with a multifocal IOL. If I have a cataract, why do I have to wait to remove it? Although there are great benefits to cataract surgery, it is still a surgical procedure and with all surgical procedures there are risks. In addition, insurance sometimes requires the cataract be at a specified stage to where the cataract symptoms are hindering your activities before it can be removed. The best time to have cataract surgery is when the cataract is interfering with your vision to the point it is affecting your daily activities and lifestyle. Some facilities perform what is called clear lens extraction. This procedure is essentially cataract surgery without the cataract. When someone is not a candidate for LASIK, they may opt to have their healthy, natural lens replaced by an IOL to make them less dependent on glasses and contacts. The doctors at Eye Care Specialists do not perform clear lens extraction. They do not feel a patient should undergo surgery to remove a perfectly healthy lens. What options are available for cataract treatment? There are no drops, injections, or medications that treat cataracts. Sometimes updating your contacts or glasses prescription can help your vision but the only true solution to correct a cataract is to replace the clouded lens with an intraocular lens implant. If you do not remove the cataract, your cataract symptoms will worsen as the lens continues to become more cloudy and vision continues to decrease. 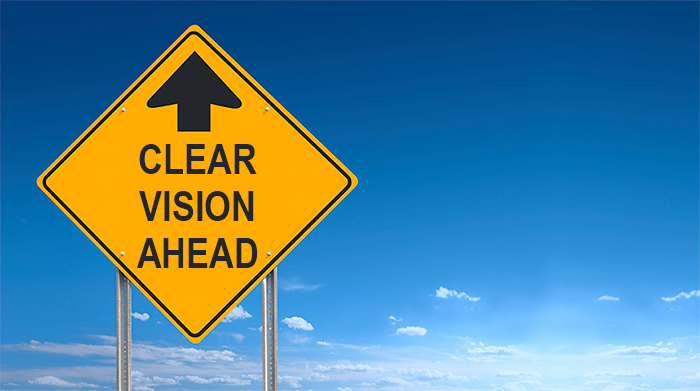 Eventually changes in prescription will no longer help clear your vision. When is it time to have cataract surgery? Regular eye exams with your optometrist will follow the progression of your cataract. Be sure to communicate any cataract symptoms with your eye doctor, any changes in your vision, and effects these changes have on your daily activities and lifestyle. When changes in your contacts and glasses prescription no longer help, your optometrist will refer you to an ophthalmologist, an eye M.D., for surgery. The surgeon will conduct a pre-operative exam and detailed measurements, perform the surgery, then you can follow-up with your regular eye doctor for your post-operative care. Eye Care Specialists works closely many optometrists in the tri-state area. Insurance may also play a factor in when you can have cataract surgery. Medicare and some insurance companies require cataract surgery to be “medically necessary” which they deem as your best corrected vision is 20/40 or worse. This means if you can still get glasses and contacts that allow you to see 20/20, you will have to wait to have the cataract removed. You can have cataract surgery after LASIK. Be sure to share with your surgeon any information you have from your LASIK procedure. Dr. Parker provides a “manifest label” for your medical records after LASIK. 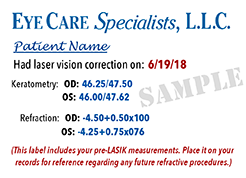 This label shows what your prescription and measurements were prior to LASIK which can be helpful to your surgeon when choosing your IOL. Occasionally the IOL implanted during your cataract surgery may not clear your vision as well as anticipated. In this instance, it is possible to perform LASIK to make minor adjustments to your vision after cataract surgery. Can cataract surgery correct my astigmatism? If you have an astigmatism, you could possibly qualify for a toric lifestyle lens to corrects your astigmatism. This IOL would allow you to be less dependent on your distance glasses after surgery but you may still need reading glasses. Toric IOLs are considered an elective upgrade and incur out-of-pocket fees as these lenses are not covered by insurance and Medicare. Do I need a referral for a cataract consultation? If you are having cataract symptoms and would like to be evaluated for cataracts, you do not need a referral from your regular eye doctor. Eye Care Specialists has a large referral network of optometrists we work closely with so you will have the option to follow-up with an optometrist or see your surgeon for your post-operative care following surgery. Can I have cataract surgery if I have glaucoma? It is possible to have cataract surgery if you have glaucoma. Your doctor will advise you on your options and provide instructions for your glaucoma medications before and after surgery. Cataract surgery is a quick, painless, outpatient procedure and typically lasts 20-30 minutes. 1,† “Cataract surgery: replacing your cloudy lens.” Alcon, a Novartis Division, Web. Accessed April 3, 2017. 2,^ “Common Eye Disorders – Cataract.” Centers for Disease Control and Prevention (CDC), Web. Sep 2015. Accessed April 3, 2017. 3 “Facts About Cataract – Is cataract surgery effective?” National Eye Institute, Web. Sep 2015. Accessed April 3, 2017. 6 “Treating Cataracts with Surgery – Understanding the Surgery” Alcon, a Novartis Division, Web. Accessed April 3, 2017. 7 “Wilmer Eye Institute: Cataracts FAQ – Prognosis” Johns Hopkins Medicine, Web. Accessed April 3, 2017. 8,~ “My Cataract Journey – Potential Risks and Complications” All About Vision, Web. Accessed March 28, 2017. 9 “Cataract Surgery: What is a secondary cataract.” American Optometric Association (AOA), Web. Accessed March 28, 2017.